When I was at Rodeo Austin this year, I stumbled on an event that turned out to be quite interesting. What I thought was going to be a simple demonstration, turned into a delightful show. It took place in a peripheral building that I never explored on my past visits. 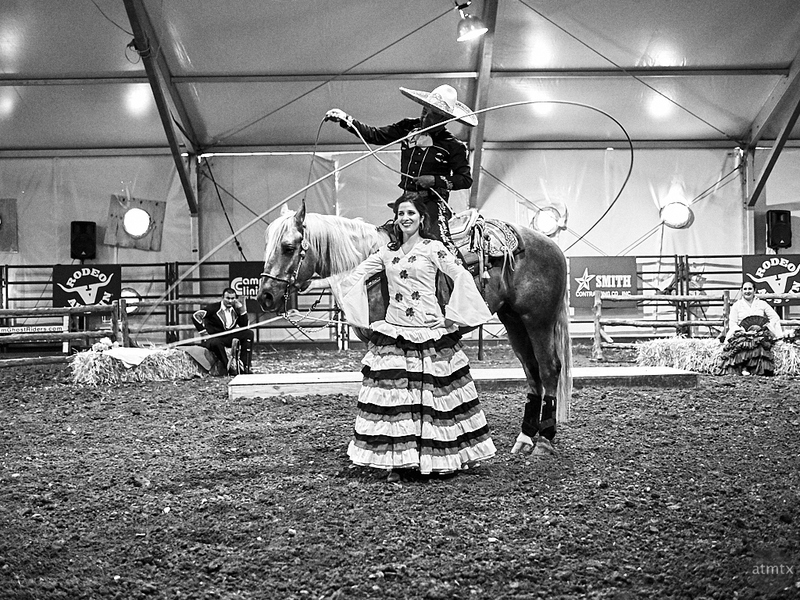 Tomas Garcilazo, originally from Mexico is a skilled Charro and Rope Artist. I found out a Charro is a traditional horseman from Mexico. They perform and compete in elaborate riding and roping events. Tomas has roped his way all over the world, on Broadway and was part of the Will Rogers Follies, Buffalo Bill and Disney’s Wild West Shows. What you can’t tell from a single still image is how Tomas continually rides and manipulates his rope in totally expected ways. Here’s a YouTube video from a different show that highlights his skills. I like the Rodeo because I get to experience a part of rural Texas culture that’s foreign to me. What I didn’t expect was experiencing worlds far beyond. I’ll need to keep an eye for other shows next year.